Forward to 26 June 2011 moth page, back to 5 June 2011 moth page, to general moths page. A relatively straightforward night and nothing really worth photograph on this occasion. 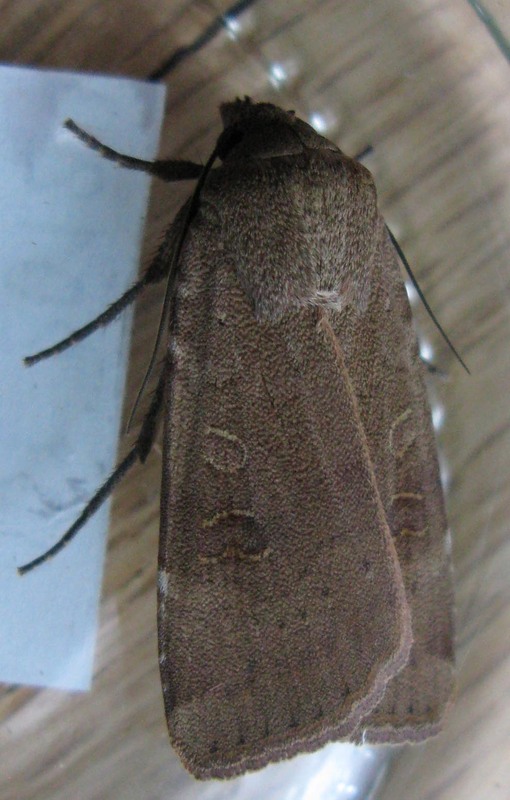 There was one Privet Hawk Moth, many Heart & Darts, several Large Nutmegs, a few Shears, Turnip Moths, Oligia agg, a Flame, a Peppered Moth, a Pinion-streaked Snout, an Oak Beauty agg, plus a few Bright-line Brown-eyes and Uncertain or Vine's Rustics. It's also worth noting that, though they aren't appearing in the trap, we've had a couple of early brood Lesser Yellow Underwing (previously photographed here) hatching from pupae indoors.